FOR RENT: accommodation in the heart of Prague's Old Town. 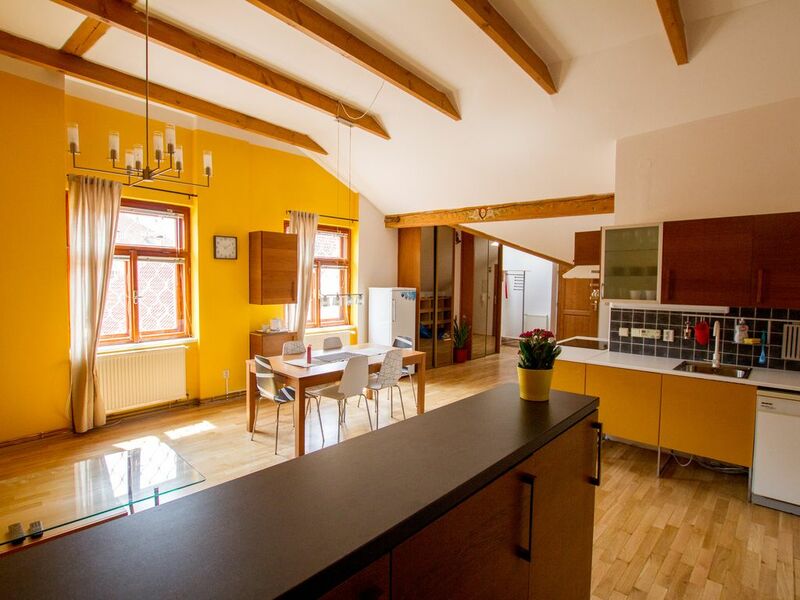 Our apartment is situated under the roof of a historic house (U Zlate Konvice - Golden Kettle House) in a street directly opposite the town hall with its famous astronomical clock. The apartment is light and spacious. From every window there are wonderful view of the roofs of the Old Town and the church spires, but it's also quiet and peaceful - noise from the streets doesn't penetrate the apartment. The accommodation has modern furnishings. There are 4 bedrooms and a child's crib is also available. In the living room is a lounge suite and coffee table , large television with satellite, a CD and DVD player. The kitchen is fully equipped with units, an electric hob and oven, dishwasher, microwave oven, kettle and coffee machine. There is also a large dining table with chairs. In the bathroom there is a bath, 2 sinks and a WC. There is also a second separate WC. A washing machine is available. Valuable items can be locked in the safe. Wi-fi available. The flat is suitable for up to 6 people. Outside you are right in the heart of things. In whatever direction you look, you see famous landmarks, galleries, luxury shops, restaurants, coffee houses and bars. Starbucks is next door and round the corner you'll find a jazz club and the Hard Rock Cafe. Beautiful, convenient, owners great to work with! Roomy, clean, super convenient, with door up to apt. literally steps from Old Town Square. Views across terracotta roof tops from every room, and views also include Tyn church spires and Astronomical clock tower! The owners and their employees were incredibly helpful with getting luggage up and down steps and helping with taxi! My biggest suggestion would be to have instructions in English for stove and washer/dryer! It was certainly a nice perk to have the dryer!! Though the apt is on the 4th floor, the stairs are not steep and the climb is broken up with landings and short hallways. Overall a wonderful experience. I would definitely rent this apt. again !! What a beautiful apartment right in old town. 100 yards from the astronomical clock. Bring good shoes, though, as it is several stories to the apartment. No lift. Everything was great. Good communication throughout the booking process. Anne met us and was fantastic about some train issues we had making us late. Would absolutely stay there again. Outstanding place, great location. Owner very responsive. Great condition, location was perfect. The apartment was large with four bedrooms that nicely accommodated our family. It is located on the top floor of a beautiful building on the old town square so it was centrally located and we could walk everywhere. The views from the apartment windows were of the beautiful rooftops and church steeples. There is no lift /elevator so you do have to climb the stairs to the apartment but that was not a problem for us because it helped us stay in shape. We had a great stay. Jindrich was great. The flat was very nice-spacious, clean, and right near old town square.